Faster, cheaper, better – the mantra of the screening industry whether using high throughput screening (HTS) or high content screening (HCS) to identify leads and select new drug candidates to take forward into development. Screen compound libraries faster, perhaps using smaller, smarter sets of compounds tested in parallel. Reduce the cost of HTS and HCS through miniaturization. Improve the results of screening by using more relevant cell, tissue, and disease models and software tools that can integrate instrument systems and datasets. Overall trends in HTS and HCS continue to focus on gathering more and better information in less time at less expense. Following are examples and perspectives on advances and challenges in screening technology. 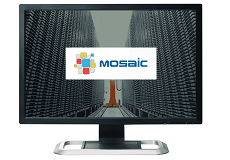 Titian Software’s Mosaic combines inventory tracking, sample ordering and workflow management functionality into one seamless system that can integrate with and manage an extensive range of laboratory instrumentation and automated stores. Late last year, the U.S. National Institutes of Health awarded MIMETAS and the University of Pittsburgh a SBIR grant to support development of the company's liver-on-a-chip platform for high throughput discovery and development. The goal of the technology is to provide a liver tissue model in a microfluidic device to enable accurate prediction of hepatotoxicity without the need to screen drug compounds in animals. "Pharma companies realize that most of the preclinical testing they have been doing just isn't good enough," says Jos Joore, PhD, Managing Director and co-founder of MIMETAS. As many as 9 in 10 drug candidates fail in clinical testing, and the majority of this attrition is due to toxicity and efficacy issues. In Joore's view, Pharma needs 3D tissue models that will better allow them to predict more accurately how a compound will function in humans. Pharma first began evaluating MIMETAS's organ-on-a-chip technology in the toxicology and preclinical setting and has now increasingly been using it to identify new drug compounds with novel capabilities, according to Joore. "Over the last year-and-a-half, we have seen a significant trend toward Pharma wanting to model a specific disease phenotype -- such as vascular fibrosis or complex diseases like Parkinson's or Alzheimer's disease -- in an organ-on-a-chip device to screen compounds," Dr. Joore says. 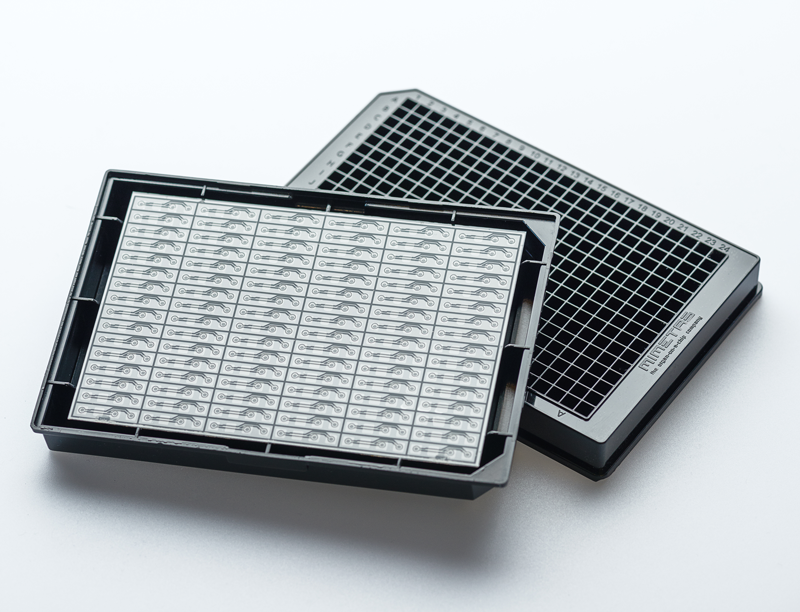 The company's OrganoPlate® technology enables co-culturing of layered levels of different cell types in extracellular matrix within separate but juxtaposed microchambers, allowing the cells to interact with each other and also be continuously perfused with medium. Zurich-based CellSpring is developing 3D Bloom® biomimetic microtissues for use in screening to predict the safety and efficacy of drug compounds. 3D Bloom technology is based on a chemical interaction between two biopolymers that crosslink as soon as they come in contact in a microplate well. When cells are added, such as hepatocytes or tumor cells, they become trapped in an environment that closely mimics the physiology and extracellular matrix present in vivo, forming liver or tumor microtissues, respectively, for example. Cells grown in 2D cultures have very different expression patterns of genes, proteins, and potential drug targets compared to what those cells would be expressing in the body. 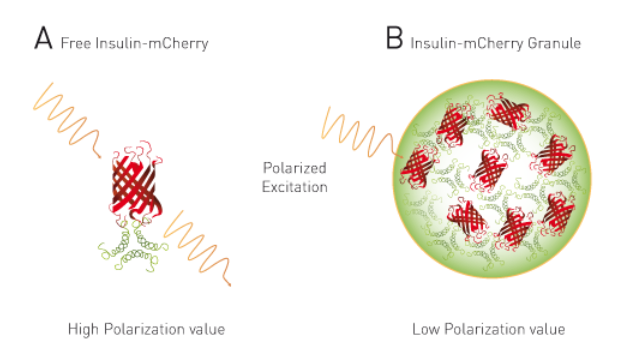 In 2D culture, the cells are not exposed to the same mechanical influences, external signals, or rates of diffusion, which can all affect gene expression. These factors can be simulated in 3D microtissues. "Especially in tumors, there is a certain distance between the cells and the blood vessels that are carrying a drug," says Chris Millan, PhD, CTO and co-Founder of CellSpring. "You not only have to give the cells the right mechanical environment, but you also have to simulate the way they receive molecules from the vasculature." The 3D Bloom technology is based on two biopolymers (3DB1 and 3DB2) that crosslink spontaneously after mixing in the presence of cells. After the 30 minutes (middle step), media can be added and a screening is initiated (right). 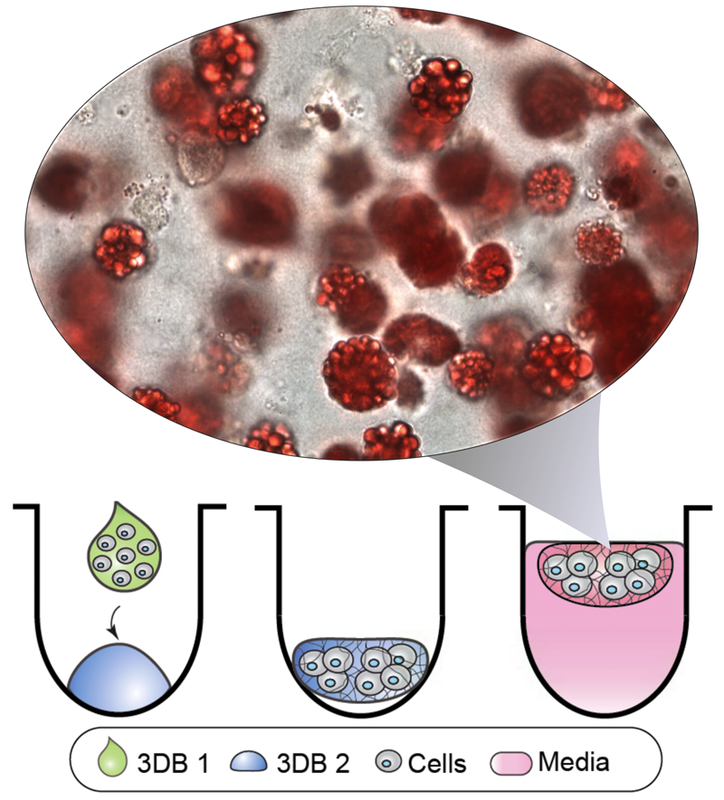 The microscopy image is of human adipose cells stained with Oil red O to visualize their lipid droplets. CellSpring worked with Tecan to automate the process of drug screening in 3D Bloom microtissues on the Freedom EVO® platform. Automation improves speed, consistency, and throughput, making it possible to screen larger numbers of compounds, and ensures that "there will be no human error so we can be a lot more confident with our results," says Dr. Millan. The biggest challenge at present is creating microtissue models that incorporate cells typically found in the blood -- white blood cells and other types of immune cells -- the natural environment of which differs from that of solid tumor cells or organs. "It is hard to have properties of both in a simplified in vitro model," says Dr. Millan. "That is where the challenge is, but also where the focus is, and I think it will be solved." Andrea Krumm, Application Specialist at BMG LABTECH sees growing interest in HTS in academia, with more universities setting up HTS facilities. These HTS capabilities are meeting internal needs for compound generation and testing and for studying signal transduction pathways, for example, and are serving as a technology platform to offer to non-academic and corporate partners. "Nowadays the go-to plate formats for HTS seem to be 384- and 1536-well," says Krumm. Although the use of 3456-well plates can increase throughput and decrease costs due to assay miniaturization, plate handling and well filling tasks become more complex, and the need for specialized instruments can reduce the benefits of switching to a higher-density plate. Users of BMG LABTECH's PHERAstar microplate reader "run mainly TR-FRET (such as HTRF or LanthaScreen™) assays and AlphaScreen®," says Krumm, noting, however, that fluorescence polarization is regaining popularity, "mainly due to its easy and low-budget assay preparation and to the high sensitivity and low variability that high-tend plate readers allow today." To decrease detection time on its PHERAstar FSX reader, BMG LABTECH equipped it with a high-frequency excitation laser for TRF/TR-FRET assays that excites samples at 337 nm. "With 60 laser flashes per second, it allows ultra-fast TR-FRET endpoint and even TR-FRET kinetic measurements," says Krumm. Advances in assay technology are continuing to drive new HTS capabilities, and Krumm provides an example in the NanoBRET™ technology from Promega for studying protein-protein interactions. BMG LABTECH is collaborating with Professor Kevin Pfleger from the University of Western Australia and Promega on a joint grant focused on using BRET technology to analyze ligand binding to GPCRs in living cells. Promega's NanoLuc® luciferase "yields a much stronger signal and has a smaller size than conventional luciferases," says Krumm, allowing it to be combined with various biomolecules "without affecting their biology and still delivering strong detection signals." Earlier this year, BMG LABTECH and Genedata announced a collaboration with Genedata to integrate its entire range of multi-mode microplate readers with Genedata Screener®, a data analysis and management platform designed to optimize workflows for in-vitro screening. The types of experiments and data generated in compound screening are continuing to expand with the increasingly routine use of emerging technologies such as automated patch clamping, automated surface plasmon resonance techniques, and high throughput flow processes. This can lead to gaps in the workflow. Dr. Oliver Leven, head of European business operations for Genedata Screener®, a business unit of Genedata, notes that instrument makers are challenged to integrate their instruments with a customer-specific data analysis process, and customers are challenged to analyze, manage, and share diverse datasets. “Pharma is reviving the ‘fail fast, fail cheap’ philosophy it used to try to improve preclinical and clinical testing outcomes in the setting of early-stage R&D and screening,” says Dr. Leven. The main strategies for achieving this involve performing more tests in parallel rather than in a serial fashion, using more relevant biological models such as switching from 2D to 3D cell models, and adopting more advanced testing methods earlier in the research workflow. Dr. Leven identifies automated patch clamping as one example of a testing approach that can now be performed in a screening scenario at higher throughput. 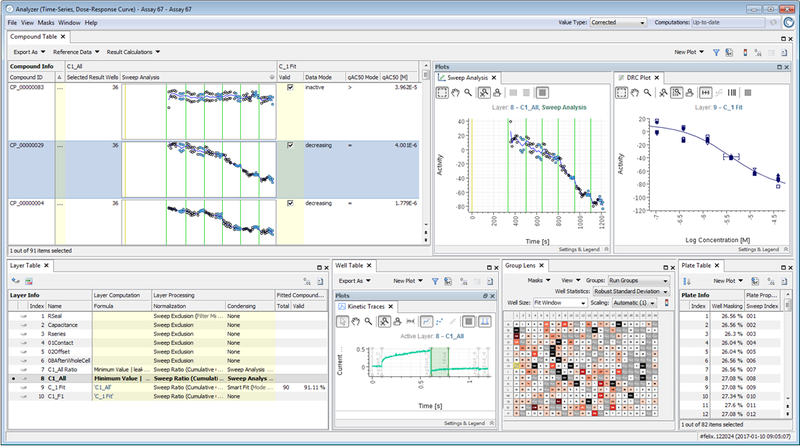 Genedata Screener for Ion Channel Screening showing an APC dataset (data courtesy of Nanion and AstrZeneca): From individual sweeps (lower mid) to per compound results, all in one software. Overview on all compounds in the experiments (upper left), drill-down into individual compound (upper mid) and dose-response curve fit (upper right). Automated patch clamping allows the screening of 300-400 compounds in the time it used to take to measure one compound, yet the same quality results must be maintained. “This imposes huge data analysis challenges," says Dr. Leven. “Scientists want to see current trace details at the time of screening data analysis, which requires access to the original recordings from which they are derived. There is a big process gap between data transfer and sharing in the screening setting,” says Dr. Leven. “If you take your results to a different software system, you leave behind all the data details and richness," he adds. The key strength of the Genedata Screener platform its ability to serve as a data hub for all screening processes, facilitating data warehousing and enterprise-wide data sharing between internal colleagues and external partners, according to Dr. Leven Genedata recently announced new automated patch clamp functionality in Genedata Screener for ion channel screening and the platform’s integration with Nanion SynchroPatch 384PE. The integration is part of the Genedata Ready-to-Run program. "The industry has needed to adapt to working with a diverse range of partnerships from academic collaborations to Pharma/Pharma collaborations," says James Craven, Head of Global Marketing at Titian Software. From the perspective of how companies access and collect samples, this is necessitating changes that make their approach to sample storage and management more agile and cost efficient. For some companies this has meant outsourcing these tasks to third party contract research organizations (CROs). Two trends driving advances in sample collection technology, which Mr. Craven says are relevant to both small molecules and biologics, are the need to access smaller volumes and more diverse sample subsets. To meet "the ever-changing need to have access to more targets and collaborate with cutting edge scientific research both academically and commercially," Titian is enabling the use of increasingly automated storage solutions, acoustic tubes for assay ready plate creation, and global ordering functions that facilitate access to inter-company and inter-CRO sample subsets. As large Pharma adopts and helps to refine and bring into mainstream research new technology, such as acoustics, they make it more accessible from a cost and knowledge perspective, observes Mr. Craven. At the recent SBI2 conference, an expert panel discussed best practices and unmet needs in 3D imaging for HCS and high content analysis. A summary of the session states, “For screening applications, a 3D model is only as useful as the information that can be extracted from it with appropriate high-throughput and efficiency” (Assay Drug Dev Technol 2017;15). “Emphasis was primarily devoted to the new developments of automated high-content microscopy that address spheroid detection…. Optimizations such as U-bottomed and low-bind plates continue to enable high-resolution imaging techniques…combined with high numerical aperture water immersion lenses able to resolve single cells. Other trends to utilize bright-field microscopy at low magnification before switching to higher magnification and resolution are being adopted to refine region of interest locations in an automated manner. " The complexity of the screening workflow allows for many opportunities to introduce improvements that can impact the overall throughput, quality, output, and cost of the screening process. From novel assay and detection methods, advances in imaging technology, and new types of cell and tissue models, to developments in automation, systems integration, and data analysis, continued innovation will enable screening of compounds more efficiently. The ability to study the activity of novel chemical entities and emerging drug candidates in model systems the more closely mimic normal human physiology and disease phenotypes holds promise for generating truly predictive data to guide compound selection and development. Vicki Glaser is a freelance writer living in Pennsylvania.